An American author, who wrote observations like the above during the late 1800’s and early 1900’s, Wharton won the Pulitzer Prize for fiction in 1921 for her novel The Age of Innocence, becoming the first woman to win the award. Wharton began her literary career early, publishing a short novel entitled Fast and Loose when she was fifteen. Wharton is best known for The Age of Innocence, Ethan Frome, and The House of Mirth. In 2012, Vogue Magazine honored the author with an 18-page spread and showed that Wharton’s influence lives on. Edith Newbold Jones was born into a wealthy family in New York on January 24, 1862. She studied under private tutors and began to hone her writing skill at a young age. During her childhood, her family vacationed in Rhode Island in the summer. The family also traveled to Europe when Edith was four and toured the continent for five years. Wharton published a short novel when she was fifteen and a poetry collection, Verses, a year later. Critics commented on Fast and Loose: “Every character is a failure, the plot a vacuum, the style spiritless, the dialogue vague, the sentiments weak and the whole thing a fiasco.” Wharton took the criticism in stride and continued to write. She married Edward “Teddy” Robbins Wharton in 1885. In 1891, Scribner’s magazine published her short story “Mr. Manstey’s View.” In 1901 in Massachusetts, Wharton began to construct her home “The Mount,” which is now a National Historic Landmark. 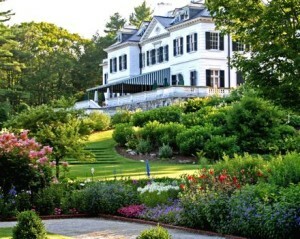 The Mount located in Lenox, Massachusetts. Wharton published her novel The Valley of Decision during 1902, the same year that she met Henry James, a British writer born in America who remained a long-term friend of Wharton’s. During her lifetime, Wharton also crossed paths with literary figures Jack London, F. Scott Fitzgerald, and Sinclair Lewis. Wharton’s first major novel was The House of Mirth, published in 1905. The novel was a best-seller that year, and it focused thematically on classism cultivated in the high society environment in which Wharton was raised. She wrote several more novels and a collection of essays before divorcing her husband in 1913. Edith Wharton’s novel Ethan Frome was published in 1911 and still appears in many high school curricula today. The novel highlights internal conflicts about whether to follow societal norms or to live according to one’s own desires and ambitions. When World War II began, Wharton ran hostels and fund raised to help refugees in France and Belgium. Wharton wrote about her experience caring for the sick and wounded in Fighting France (1915) and The Marne (1918). In 1916, she won the French Legion of Honor in recognition of her work during the war. Wharton went on to publish her Pulitzer prize-winning novel The Age of Innocence in 1920. She received an Honorary Doctorate of Letters from Yale University and was elected to the American Academy of Arts and Letters in 1930. As it turned out, Wharton’s winning of the Pulitzer Prize was wrapped in controversy. Sinclair Lewis’s Main Street was the favorite to win, but the head of the advisory board overturned the judges’ initial decision. The head changed the award’s specification from best fictional account of the “whole atmosphere of American life” to “wholesome American life” in order to better suit The Age of Innocence. Wharton herself felt that the Board had made a mistake, but, nonetheless, she goes down in history as the first female winner. Women had only gained the right to vote in the United States one year prior, so the significance of a female Pulitzer prize-winner was substantial. Edith Wharton died of a stroke on August 11, 1937. Having garnered literary acclaim early in her life, she is an icon for aspiring young authors today. The thematic elements of her novels challenged societal structure in the late nineteenth and early twentieth centuries, paving the way for further literary arguments against restrictive moral views.